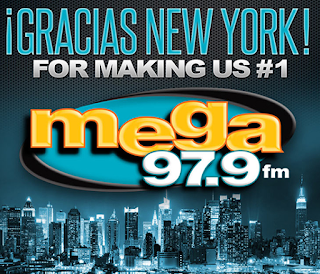 Spanish Broadcasting System Inc. (SBS) announced today that its flagship New York City station, (WSKQ-FM) "Mega 97.9" has achieved a historic milestone in claiming the #1 ranking for two major demos, 18-34 and 18-49, among ALL radio stations serving the Tri-State area, regardless of language or format. This historic achievement highlights the sustained dominance that broadcast radio continues to have in the daily lives of today's Hispanic consumers. SBS sister station WPAT-FM ("93.1 Amor") also achieved significant ratings gains and strengthened its market position in Nielsen's recently released Audio Report. Eric Garcia, SBS Radio Revenue Chief and General Manager of SBS-New York commented, "WSKQ-FM has served as the epicenter for Latino culture in New York City for over thirty years. These most recent Nielsen results solidify our leadership position in the market place as we continue our service and responsibility to the New York Metro Latino community and overall client base. Mega 97.9 today is stronger than ever, with offerings expanding from over the air radio, digital, mobile, and experiential programs. These record-setting achievements are backed by the most compelling on-air personalities in the nation, programming the best in music and syncing with our concert events. Congratulations to the entire SBS family for their incredible efforts, and making history once more in the Big Apple." SBS Executive VP of Programming and Multiplatform Coordinator, Jesus Salas, added, "Once again WSKQ-FM is the #1 ranked radio station in New York City, regardless of language, WSKQ-FM Mega 97.9 New York, has forged an remarkable and deep bond with each of the millions of listeners at the hyper local level. We have an excellent team in New York and our promise is to continue to provide the most innovative and compelling multiplatform content on air, online and at our exclusive live concert events." La Bella Miss Haiti 2017, Raquel Pelissier visita a el vacilón.